Happy Wednesday! I hope your'e having a great week! In last week's Instagram Roundup, I mentioned that we applied to adopt a dog that the girls and I met at the local animal shelter. Well, our application was approved and as of Monday, he is officially with his fur-ever family, us! Can y'all believe that my husband that me adopt a dog that he had never even met before?! I can't either lol but he definitely must trust me! 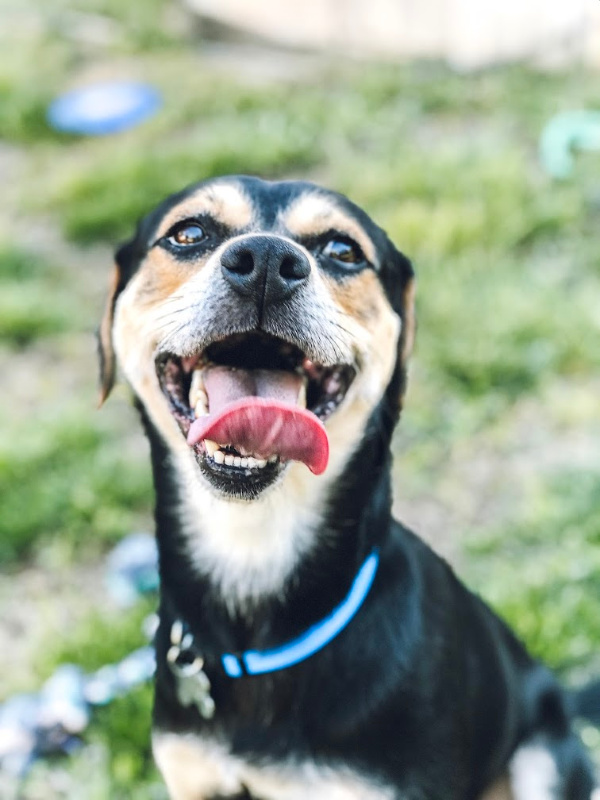 Our sweet boy's name is Jethro and he is a shepherd mix. The shelter estimates that he is about three years old. He is so energetic, playful, and great with with the girls! Such a good family dog and Maggie (our 11 year old beagle mix) is doing very well with him so far. I think she's happy to be a new furry companion! 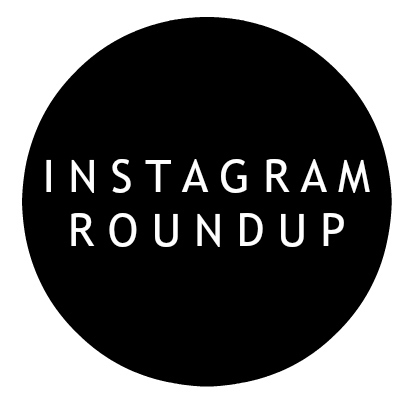 Today, I'm sharing my weekly Instagram Roundup with lots of spring outfit inspiration. I was on spring break last week so I was able to wear outfits other than my work tee and jeans. Yay! I officially need a camellia bush after seeing this gorgeous flower at the arboretum! Just so pretty. See more of this outfit in this blog post. Spring sandals and jackets for a cool spring day. This jacket has gotten so much use this season! 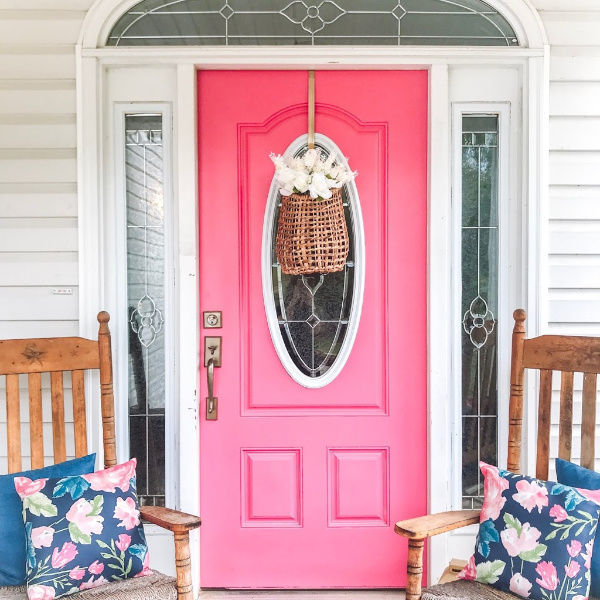 My front porch got a spring refresh! I found this adorable pillows at Walmart for only five dollars each and the flowers in the basket are from the Dollar Tree. 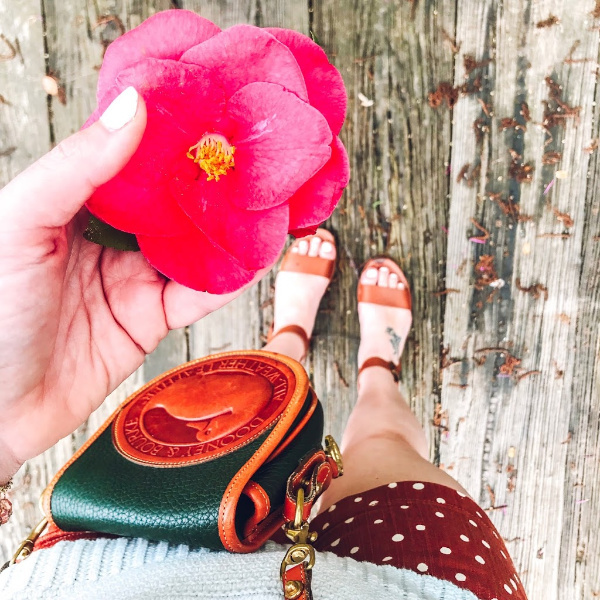 Spring on a budget! These leopard slides are my favorite shoe purchase of the season! So comfortable. I'm a true 8.5 and the 9 was the best fit for me. 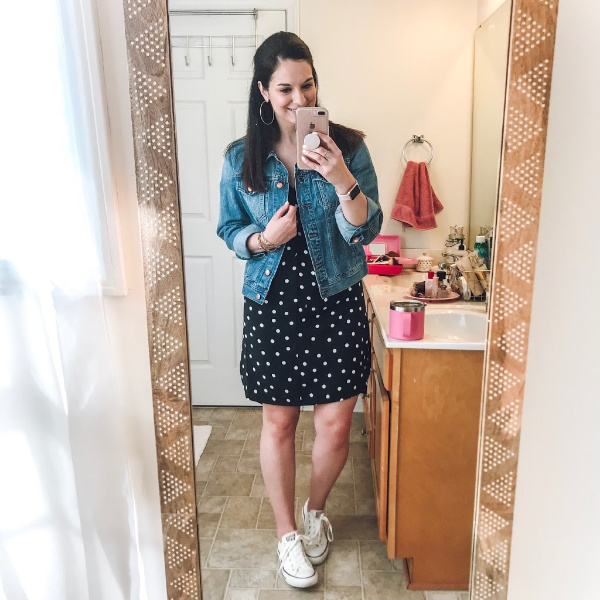 I shared this look last week in my Five Ways to Style a Polka Dot Dress post and I ended up wearing this look as my outfit for the day. I love dresses and sneakers! Mom uniform for a day at the zoo. 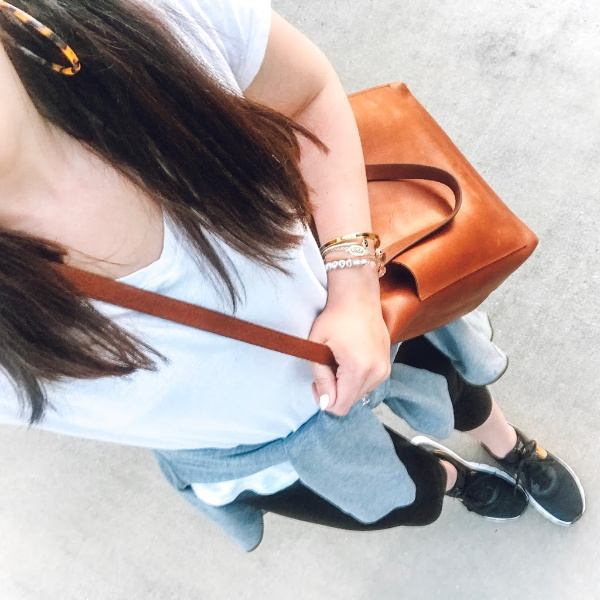 These are my favorite cropped leggings and they are super budget friendly. The fit is true to size. I found this vintage scarf at the antique mall recently and I only paid $1.60! I absolutely love vintage scarves and the print on this one is so fun. My weekly flowers from Aldi just make me happy. It's the little things! Thanks for visiting! I hope you have a wonderful day! Hey y'all! 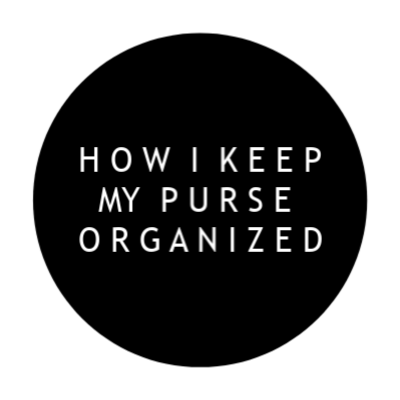 Today, I'm going to share my second installment of "how I" and tell y'all all about how I organize my purse. This is something I just recently mastered (within the last year or so). My purse has chronically been an absolute hot mess prior to then because I have to carry all of the things with me wherever I go! I am always prepared, lol. But really, I am. When someone I work with needs something, they know to come to my first because I probably have it in my bag. When I discover something that I need (or someone has asked me for) and I don't have it, I always make a note of it in my phone and then add it to my bag when I get home. For example, stevia is the only sweetener so I realized that I need to carry some packets of it with me as well. But, the need to carry everything but the kitchen sink, can lead to an extremely messy purse situation. 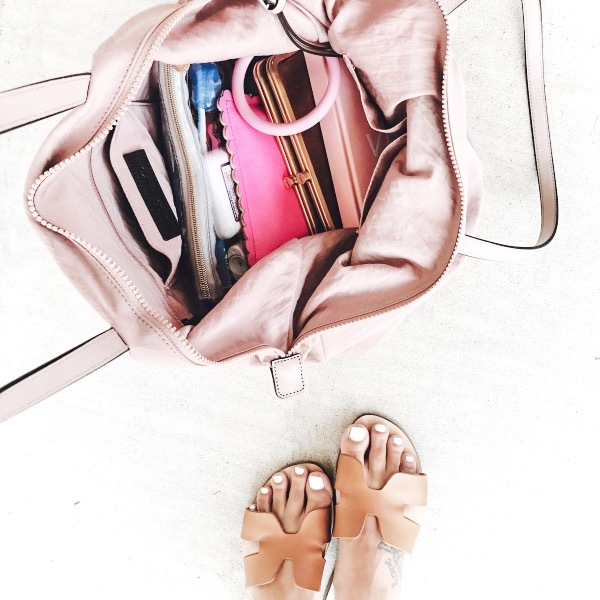 In today's post, I am going to walk you through what's inside of my bag and how I keep it organized on a regular basis. Bonus: my tricks also help making switching your purse even easier! 1. W A L L E T | I have been carrying a Hobo wallet for years and this Lauren one I've had for almost two years. Besides some normal wear on the leather, it's in perfect condition! 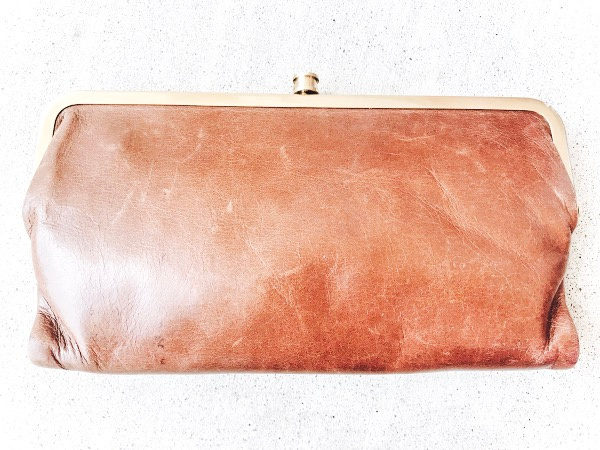 I love a big wallet and this one can even hold my checkbook when I need to bring it with me. So many different compartments and tons of space. I love it! 2. 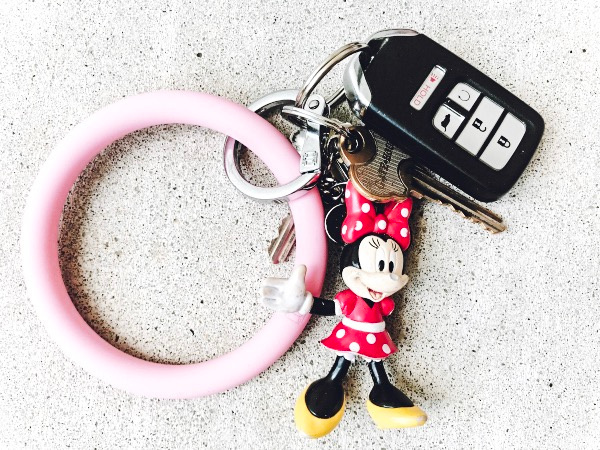 K E Y R I N G | Of course, we all carry around keys but do you have an O-Ring from O-Venture yet?! Every woman needs one of these, especially moms! First of all, it makes finding your keys when they are inside your bag so much faster! Secondly, you can slide this on your wrist when you need to be hands free but didn't bring with your purse with you. One of the best inventions ever. I have gifted one to my best friend and my mom, who also love it! 3. P L A N N E R | I've always used a planner but a much larger one that took up too much space and weighed my bag down. But, I always need to have my planner with me. Keeping tracking of dates on my phone just isn't the same for me. I need to write them down on a physical calendar to be able to keep up. I found this adorable purse friendly (but not too tiny because there's still plenty of space to write in it). 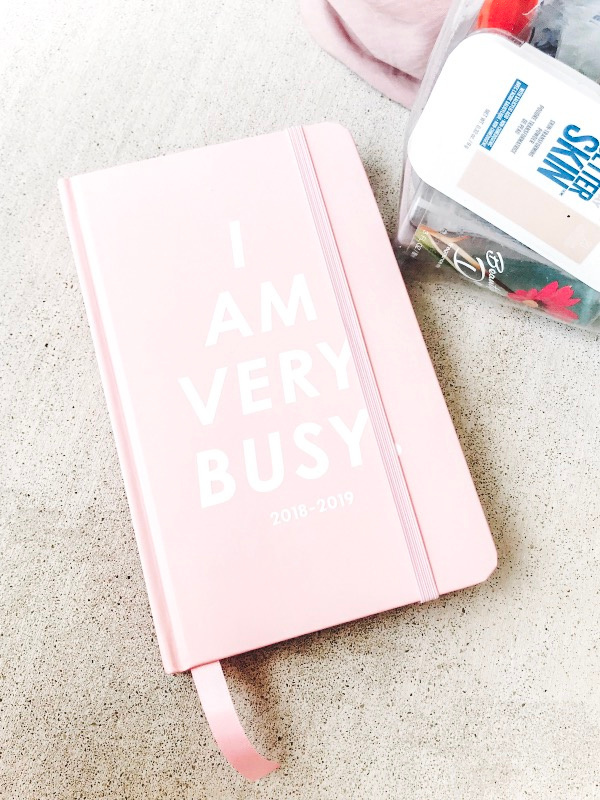 I love always having my planner on hand! 4. F I R S T A I D S U P P L I E S | This pouch isn't anything fancy; it's just a leftover Ipsy bag that I found laying around. Well, I put it to good use! 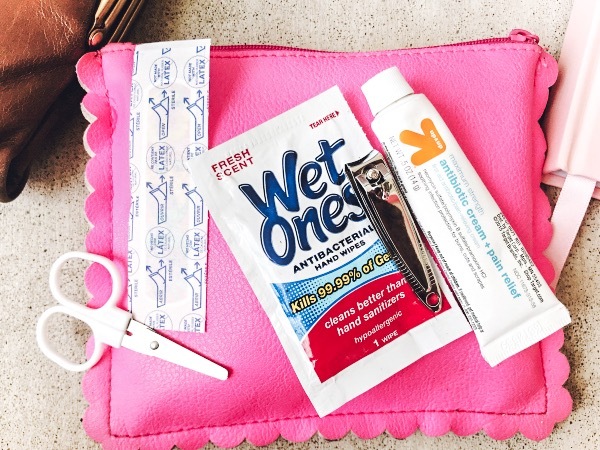 Ever since becoming a mom, I have discovered the importance of having first aid supplies (and wipes) with you at all times. My husband is also a safety manager so he makes sure we are well stocked and well prepared for a first aid situation. I stuff this little pouch with: band aids, hydro-cortisone, antibacterial wipes, fingernail clippers, tiny scissors, ibuprofen, Benedryl, alcohol wipes, antibiotic cream, and tweezers. If you don't already have a first aid kit in your bag or car, I would definitely recommend creating one or buying one. 5. C L E A R P O U C H | So, this is where you will see where I keep all of the things. But, before I talk about what I keep in it, I must tell you why I needed a solution. My bag was always a mess. Random stuff scattered everywhere. Things stuffed into every pocket. Changing purses was literally a chore! I randomly had the idea of getting a makeup pouch to shove all of the little, loose stuff into so that it would be easy to switch purses so I went online to Target and discovered CLEAR makeup pouches. The perfect solution! 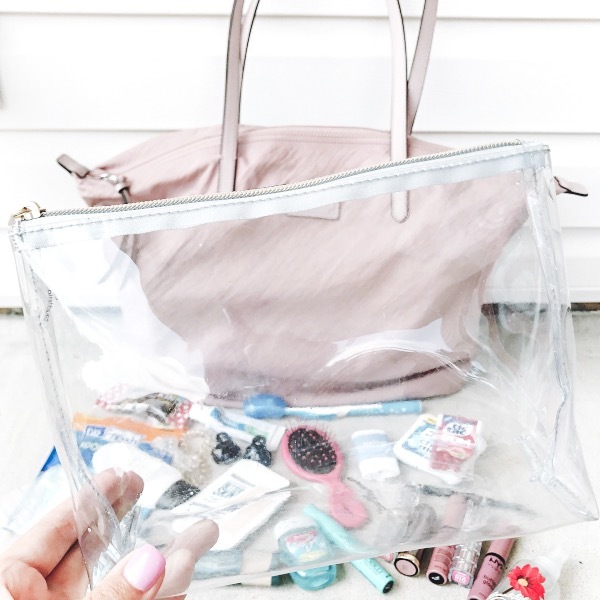 I can throw all of my random purse must-haves into this clear pouch while staying organized, still being able to see what I have (even better actually), and I can change my purse in 30 seconds or less! I also don't leave behind random stuff in my bags anymore... because I used to have at least five purses with random lip glosses, gum, and receipts in them. A lot of stuff fits into this clear makeup pouch! 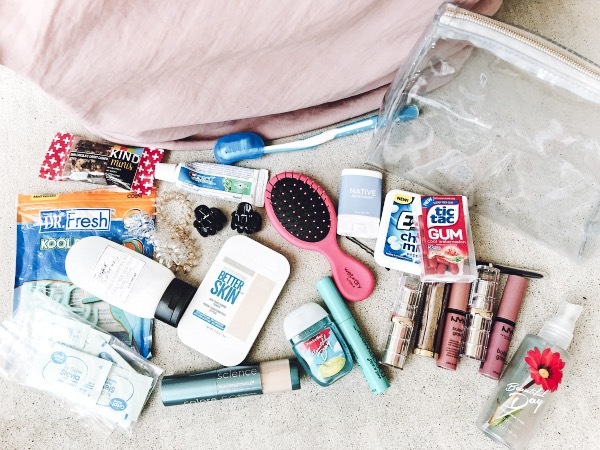 I'm able to fit toothpicks, lotion, a mini granola bar, a hairbrush, deodorant, gum, hair ties, tooth brush, tooth paste, compact, eyeliner, body spray, hand sanitizer, packets of stevia, hair clips, three lipsticks, mascara, sunscreen, two lip glosses, and mints in to this pouch with even a little room to spare (when I think of something else that I absolutely must carry around with me in my bag). My purse is more organized than it ever has been and I'd like to give all of the credit to that clear makeup pouch that changed things around for me! 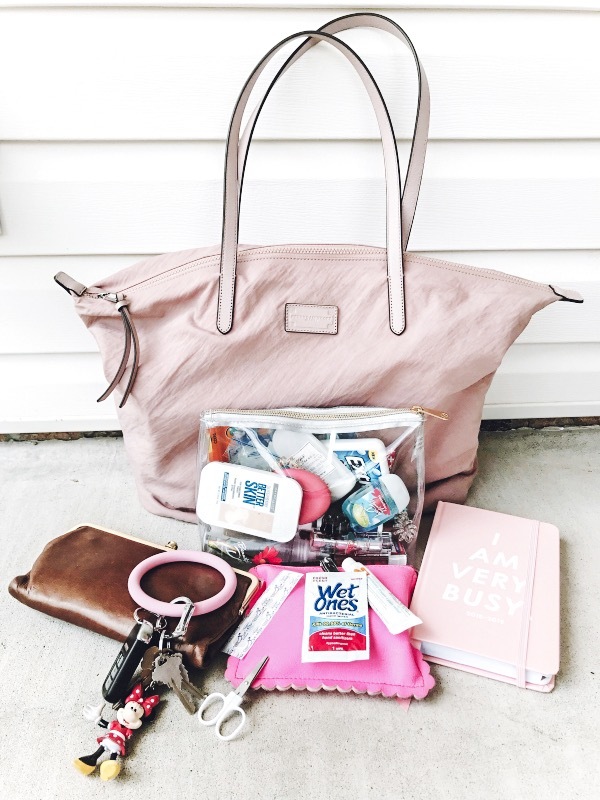 How do you keep your bag organized?! Thank so much for visiting! Have a great day! Happy Monday! I hope you had a wonderful Easter weekend! We enjoyed some family time, preparing for our new dog that we are hopefully bringing home today, and we even played Scrabble for the first time ever as a family. After we finished the game, my husband told me that it was actually his first time ever playing Scrabble and of course, he won! Family game nights are always the best! I am loving this stage with my girls! 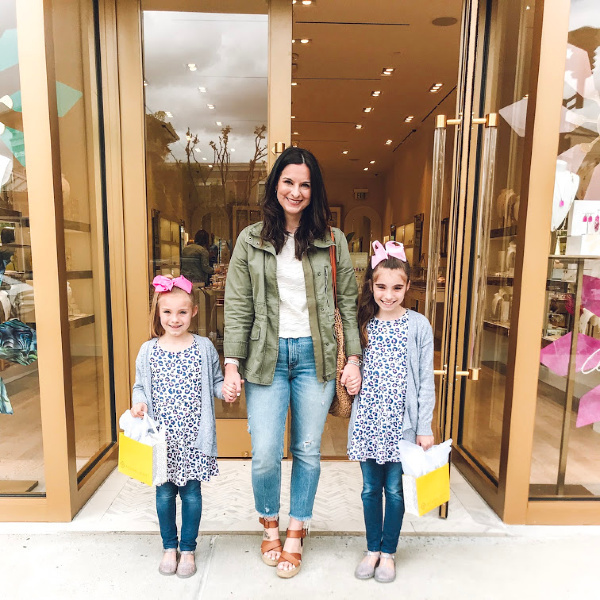 I am so excited to announce that the girls and I will be hosting a special Mother’s Day shopping party at the Kendra Scott on Saturday, May 4 from 10am-12pm! You can come shop the new collection and add some items to your wish list! There will be a pop up mani bar for any guests who purchase $100 or more + a local photographer, Jodie Brim will be there to take pictures in the photo booth! Also, there will be a mimosa bar for us moms (and they even have beer for the dads) and some fun pink lemonade + something sweet for the younger clients! This event is for all ages! Use the this link to RSVP. Julianna, Olivia, and I hope to see you there! 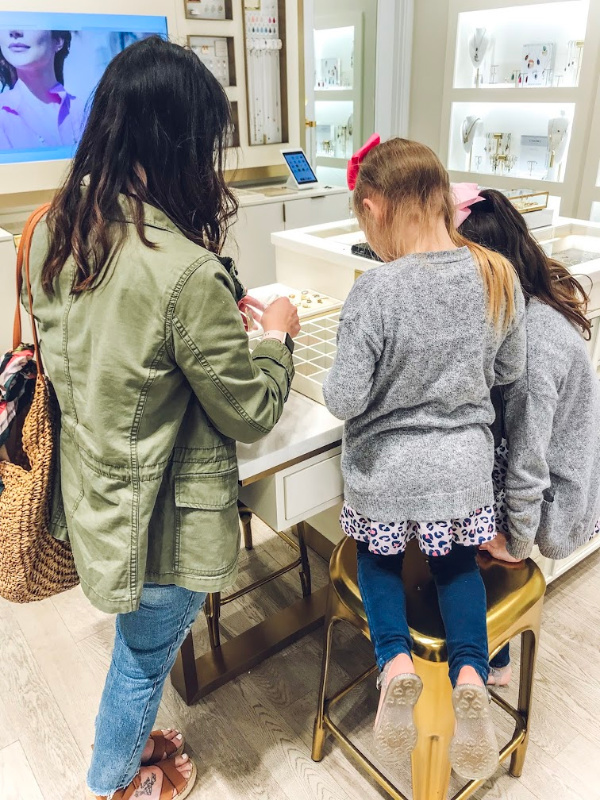 In preparation for the Mother's Day shopping party, we stopped by the new Kendra Scott store in the Friendly Center to pick out some new Kendra Scott jewels. The new summer collection was just released and they are so many gorgeous pieces. 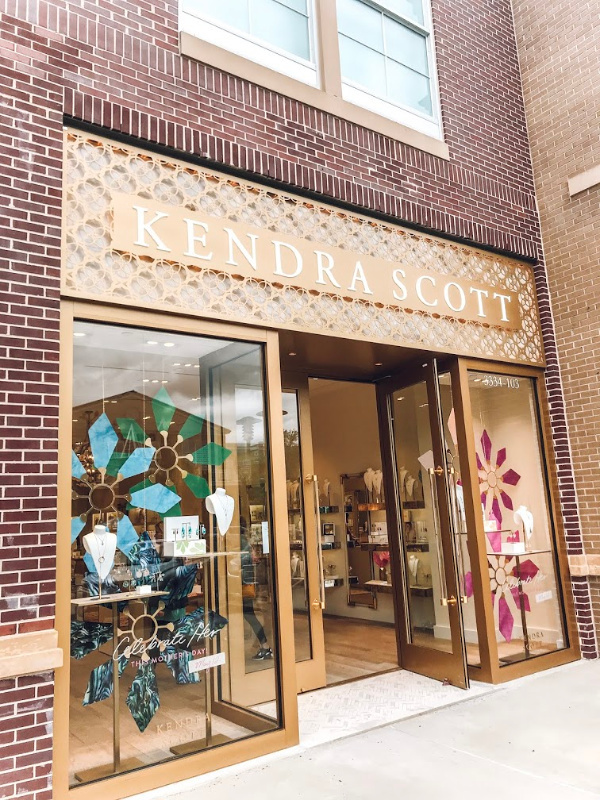 Did you know that you can customize your jewelry at Kendra Scott?! 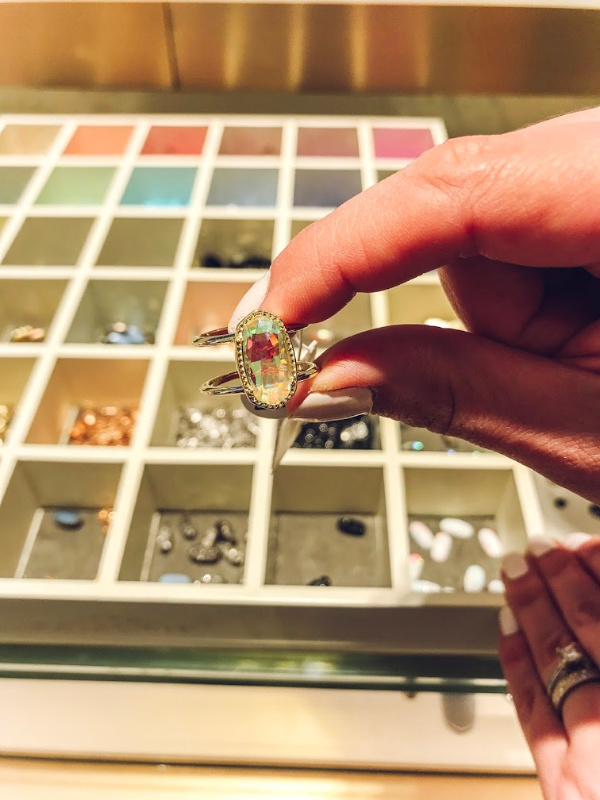 I have been a long time fan of the Color Bar where you can choose the style of the piece you want, the metal, and the stone to create something just for you. My girls and I both decided to make Color Bar pieces. 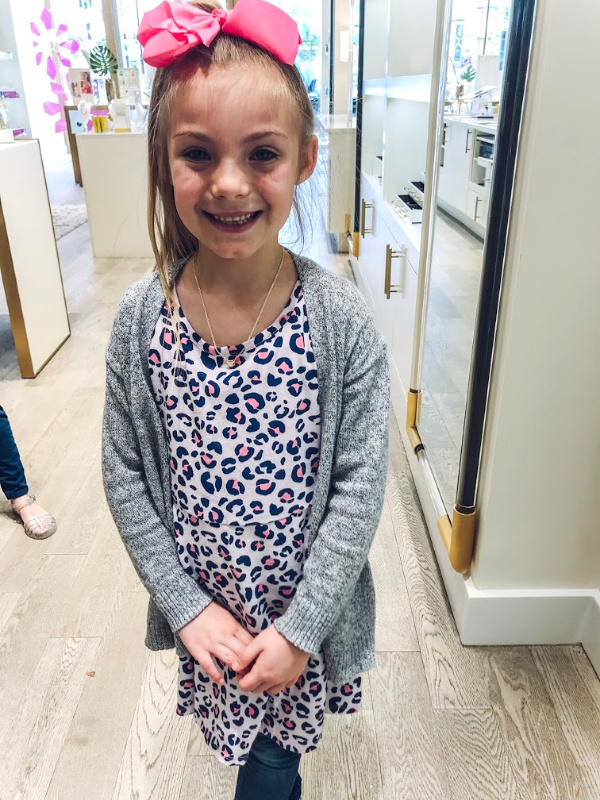 They were so super excited to get their first Kendra Scott necklaces of their very own! Julianna customized the rose gold Elisa necklace with the Dichroic Glass stone and Olivia picked the Mabel necklace with the Peach Mother of Pearl stone. 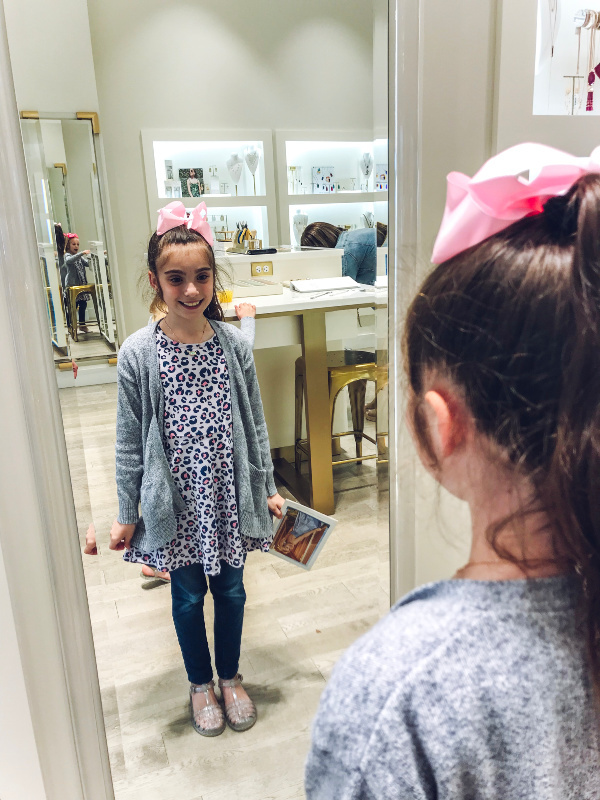 Kendra Scott isn't just for grown ups, little girls can wear it too! On their birthday month, they also can take advantage of the 50% off discount to take home any piece for half off. This would make such a great birthday gift for a special little girl! You could even customize it with their birthstone to make it even more special. 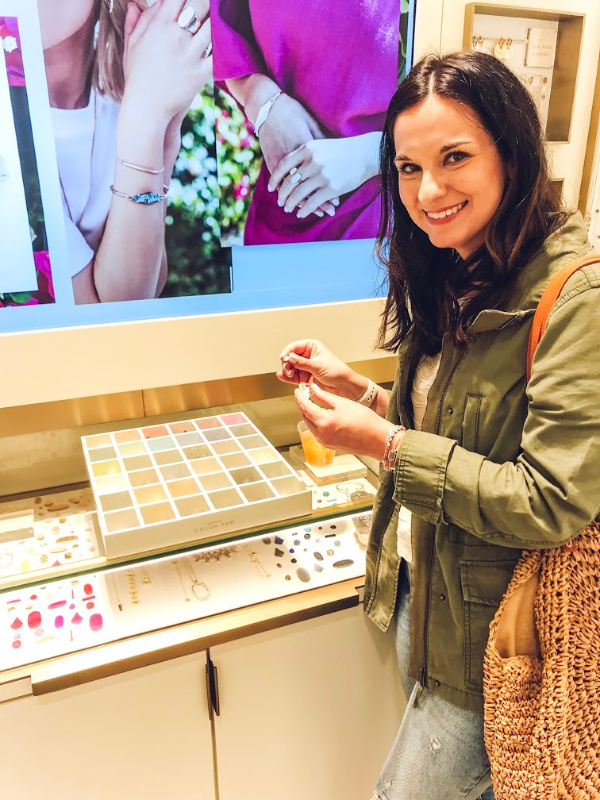 I also had so much fun picking out some Kendra Scott jewels for myself! I'll be sharing more details about the exact items that I selected soon but I want to share now that I had such a great shopping experience. 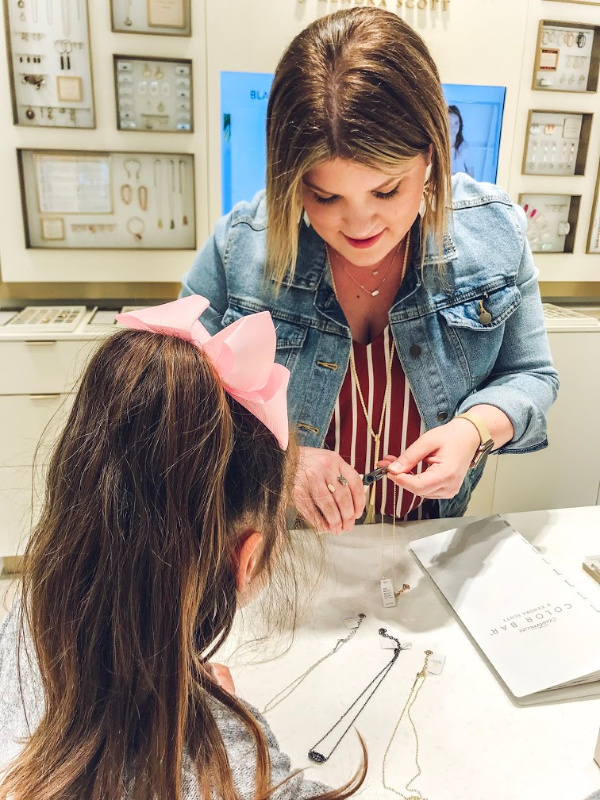 The girls at Kendra Scott are so helpful, especially Kelly! She was so patient with us and helped us find the perfect pieces. 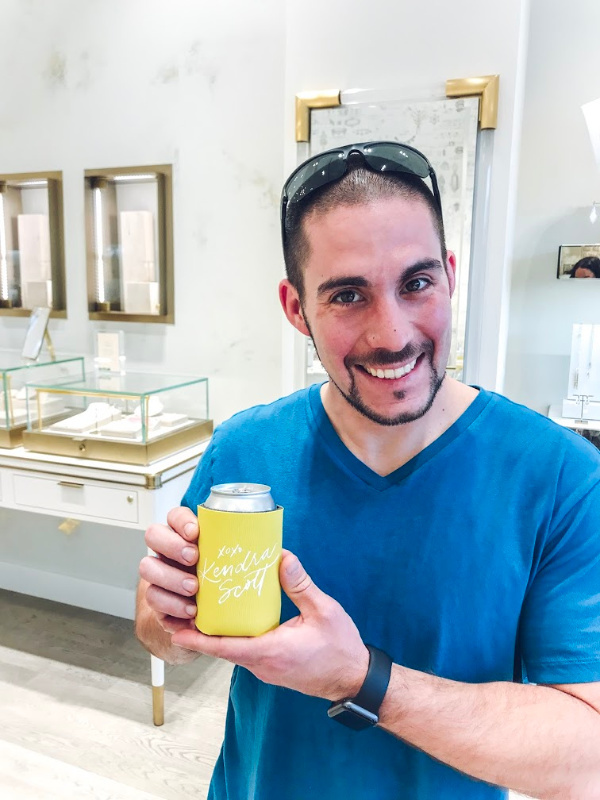 Also, Kendra Scott provides beer for the men while we shop! So, don't forget that if you need to take your man jewelry shopping. It was craft beer, too! Thank you so much for stopping by today! 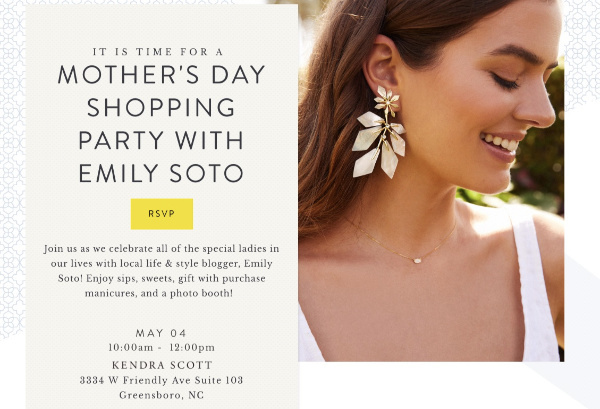 If you're local, I hope you'll be able to stop by Kendra Scott store at the Friendly Center on May 4 from between 10am-12pm to say hi! Have a great day! Happy Friday! 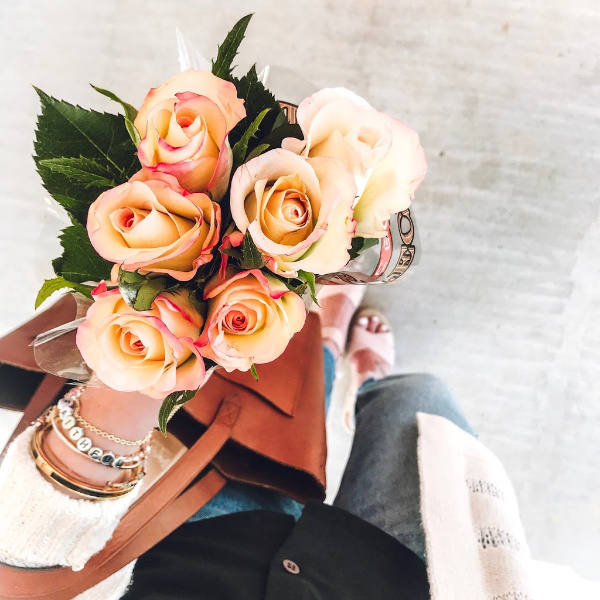 Today, I'm sharing my weekly round up of what I'm currently loving, including a couple of pieces that I already own and love. I have been loving the spring temperatures and finally being able to wear some of my spring clothes! 1. S K I R T | This skirt reminds me so much of the pattern and color of the shorts I shared in yesterday's blog post. This skirt is budget friendly and so beautiful! 2. 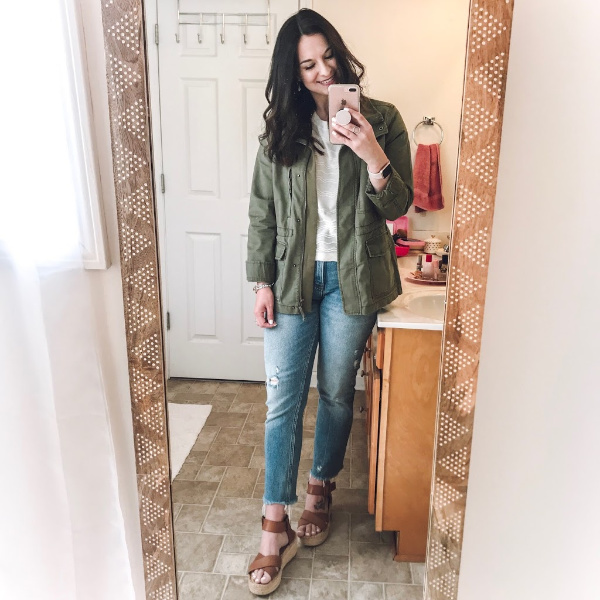 J A C K E T | If you have been on the hunt for a good, budget friendly denim jacket then I would highly recommend this one. It's under $40 and the quality is great! A denim jacket is definitely a closet staple for me, year round. 3. D R E S S | I love a t-shirt dress, especially this time of year. 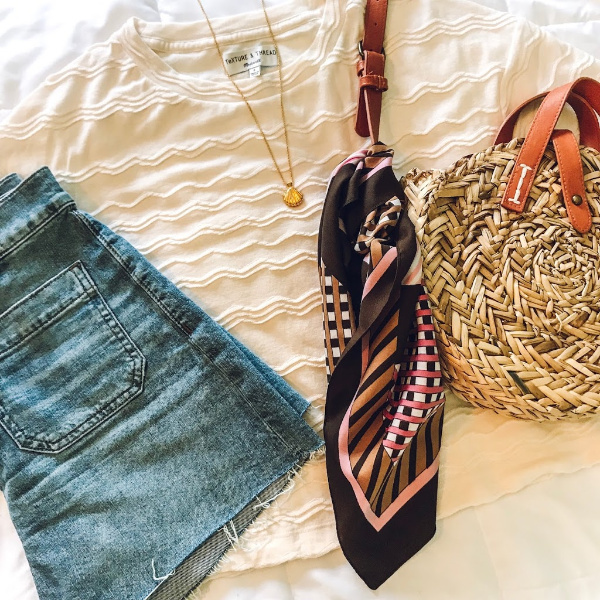 Wear it with sandals or sneakers for an easy, comfortable outfit. 4. 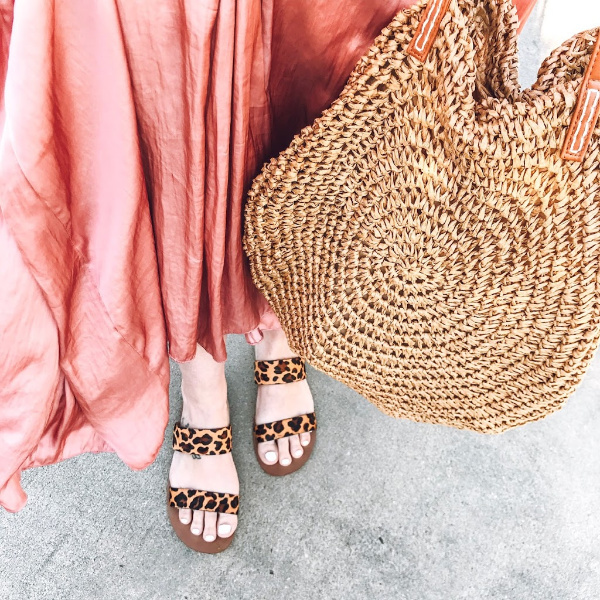 S H O E S | It's no secret that I love leopard and these fun shoes are definitely on my wish list! I love the style and the print so much. 5. G R A P H I C T E E | I don't buy many graphic tees but my eye was immediately drawn to this fun, vintage inspired one. It also has flowers on it, which are one of my favorite things! I also really love this even more budget friendly option. 6. S T R I P E D T E E | These eight dollar basic tees are the best I've found, even better than Madewell! They wash up perfectly and fit true to size. I just added this striped one to my closet! 7. 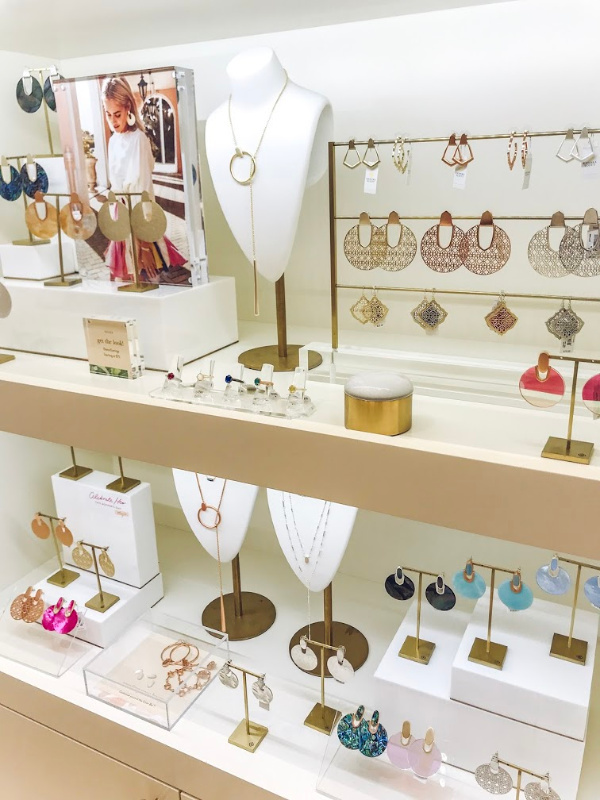 E A R R I N G S | Kendra Scott jewels are just the best. I love the details on these pretty hoops! 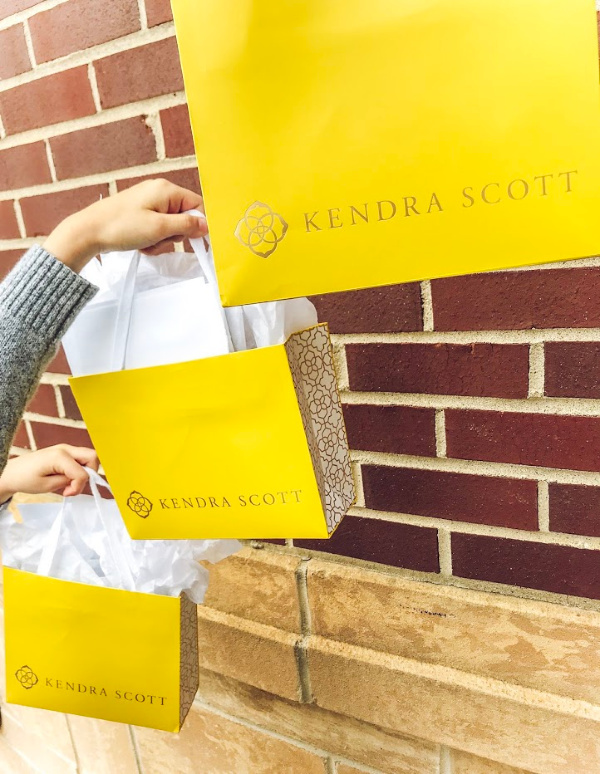 Did you know during your birthday month that you can get a piece at Kendra Scott for 50% off in store?! That's one of my favorite birthday perks! 8. B A G | How cute is this crochet bag?! 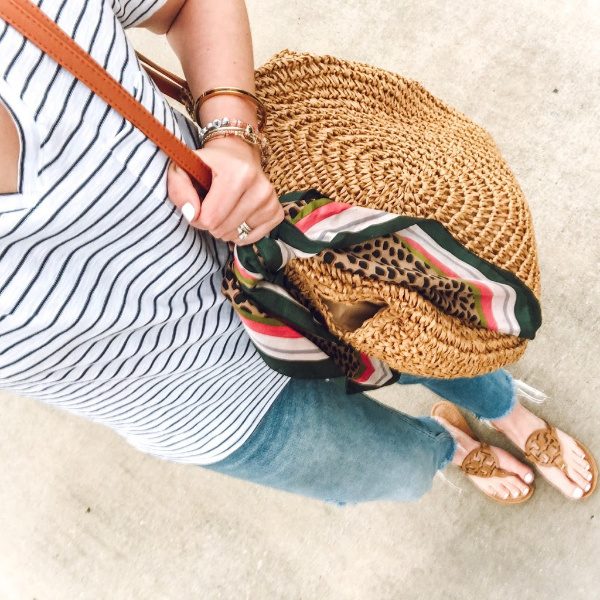 It's a great neutral bag for spring and summer! Thanks so much for visiting! Have a great Easter weekend!